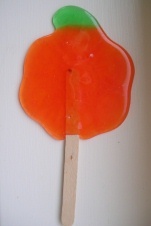 These yummy Pumpkin Lollipops are a creative edible craft for the fall season, they also work great as party favors! This craft involves using the oven, make sure children are supervised when making this craft! 2. Arrange the rest of your orange lifesavers around in circle. Break your green lifesaver in half and place at the top of your pumpkin. Make sure all of your lifesavers are touching, otherwise they won't melt together properly. 3. Bake in the oven at 250F for 12-14 minutes or until the lifesavers have melted. All ovens are different, keep checking your lollipops while they're baking! If you want to spend the extra money you can buy white lollipop sticks in the cake/baking aisle in your local craft store. If you like these candy treats, check out our Flower Lollipops! Click here to find more Fall Crafts like these Pumpkin Lollipops! Click here to find more Halloween Crafts!